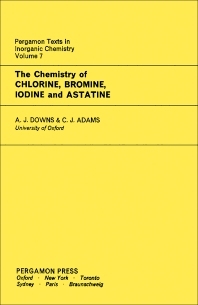 The Chemistry of Chlorine, Bromine, Iodine and Astatine is a special edition that contains selected sections and addresses the needs of specialists in their respective fields. The text describes the general atomic properties of non-metals, particularly the halogens, as being the perfect series to study, both in physical and chemical terms. The book explains that the combination of the atomic properties implies excellent electronegativity values for the halogen atoms. The text also cites some behavior characteristics of halogens that are irregular, such as chlorine and bromine are similar but differ from fluorine on one side and iodine on the other. The book also compares the general methods of producing chlorine, bromine, or iodine by 1) oxidation of halide derivatives or 2) reduction of compounds of the halogens in positive oxidation states. The text then reviews the application of a complex valence theory that raises difficult questions about the bonding in halogen-oxygen molecules. The book also explains the biological behavior of astatine that accumulates in the liver or in the thyroid gland depending on the method of administration either as a radiocolloid or as a true solution. The book is suitable for molecular biologists and researchers, molecular chemists, and medical researchers.